I recently discovered that I love lemon bars. It happened in Florida when I was on location one day for a shoot and the catering company brought them for lunch. I like to think that they were so tart and fresh because they were made of fresh Florida lemons. Are lemons even grown in Florida? Not sure. I decided to make my new-bff-dessert for Easter Sunday. I perused a few recipes online and settled on a simple one from allrecipes.com. The one I chose didn't have baking powder but some did. I'm not sure what kind of difference that would have made. To change it up a bit, I used one regular lemon and one meyer lemon that I fell for at Whole Foods. 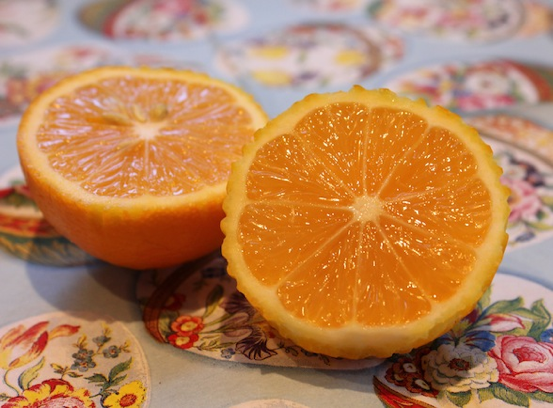 Meyer lemons have a more sweet, honey taste than regular lemons and they are smaller and more orange in color. It's like a lemon and a mandarin orange bore a less acidic hybrid child. Lemon bars have a buttery shortbread crust. It only calls for butter, flour and sugar. The crust gets baked first for 15-20 minutes and then it meets the lemon juice, egg, sugar, flour and zest mixture. Then it cooks for another 20 minutes. During the crust baking stage I began to "have kittens" (as Charlie says) when 20 minutes had gone by and my crust was airy and soft instead of firm and golden. Did I forget the flour? Aghhh I hate baking! But then I moved the tray from the top to the bottom rack of the oven and all was fine. Baking is such a moody biotch. Look at those pretty babies! And the eggs and tulips! The bars were so so so good but I can't explain why there are leftovers. Maybe not everyone shares my new obsession with them. Weird. Leftovers are best for me anyway. On another note: This is my most kitschy blog post ever and I just kind of vommed. 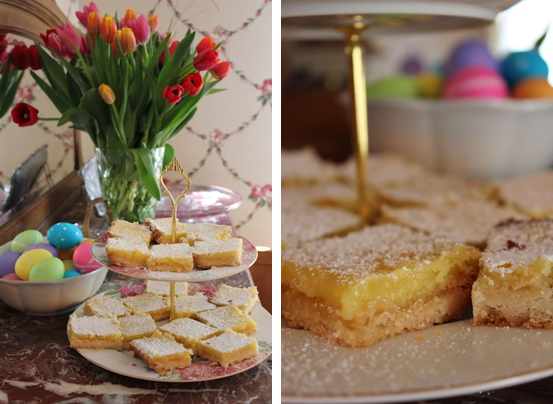 The lemon bars you made WERE SO GOOD - I can attest to that. I love lemon bars! Last summer I discovered that they are AMAZING when mashed up with one scoop of vanilla ice cream. Try it if you still have leftovers!